Script concatenation and minification is realized by processing the input (related to bundles) you provide through the config and establishing what files should and should not be in a bundle. Using the classical compressor means that you also have to provide a manual override of all the paths included in bundles so that require.js can load the right version. The auto compressor will also generate proper require modules out of your shimmed script, whereas with the classic compressor you had to do that manually. In order to know what files to load at runtime, the autoCompressor will automatically generate another configuration file that will be able to tell us at runtime what bundle should be loaded when. To find them, assuming your configuration file is named RequireJS.json, after a build using the autoCompressor you should find a file named RequireJS.override.json. You can also look at this file to debug possible dependency tree generation issues. You have to keep in mind that if you've set the LoadOverrides property to true when rendering the require config, if an overload file is present, it will be loaded. If you're trying out the autoCompressor locally, you might want to set that property to false when in debug configuration, for example. The above configuration will generate two files in ~Scripts/Bundles, public-app.js and admin-app.js, if the modules from ~Scripts/Controllers/Root does not require the file-upload or html-editor then these components will be bundled only in the admin-app.js file. By default when you install the Compressor package any RequireJS.json files with be assigned to RequireJsNetConfig build action and will trigger the compressor task at build. After each build it will create a folder named bundle inside Scripts where all your defined bundles will be compiled. PackagePath - the output directory for packages, it will default to the value of ProjectPath if not specified. 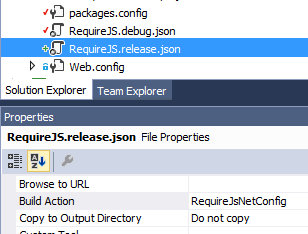 When you build or deploy the MVC project, three files will be generated: the two bundles and RequireJS.override.json. Because these files will be generated on each build, there is no need to keep them on the source repository, in order to exclude them from git you can add the following lines to .gitignore file. For more information on RequireJS.NET Compressor features please read the wiki and try out the demo projects. If you have suggestion or any kind of feedback regarding RequireJS.NET project please submit an issue here.